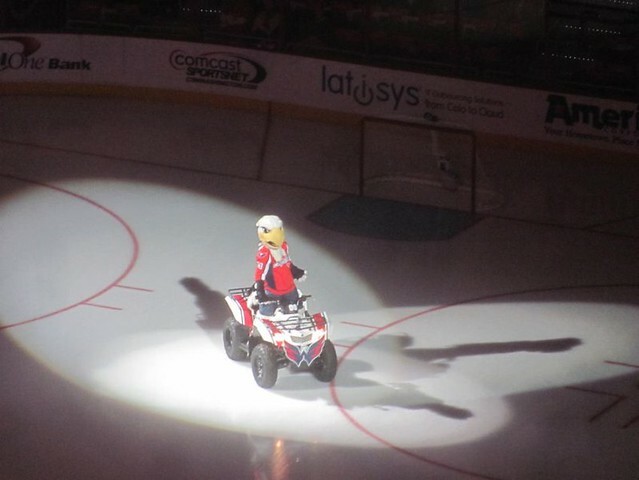 Capitals mascot Slapshot delivered the goods again this year, skating the flag onto the ice every home game without ever once tripping (which is more than Dennis Wideman or Alex Semin can say). He defied Capitals tradition by not folding under the pressure, and he did it all while wearing a 20-pound mascot head. What a pro. Best Moment: Rappeling off the Crystal City Hilton for the Virginia Special Olympics. Photo credit: Slapshot’s Facebook page. Or driving an ATV on the ice at games. Now that’s skill. Unexpected Concern of a Large Bald Eagle: Slapshot spent a lot of time tweeting about traffic. He really is a DMV mascot. Alternate Universe Superhero Identity: N/A, already a costumed hero. Alternate Career Possibilities: Possible future as a DJ. Team Role: Skate around the ice waving a large flag, elaborately prank other mascots, communicate via exaggerated mime, distribute Chipotle burritos (priority responsibility). Execution of that Role: Once again managed to never hand out those Chipotle burritos in the section that I was in. Very disappointed. Five out of ten. More insanely cute Caps Kids Club Slapshot Fan Appreciation Contest entries here. Likeliness to Return: We’re hearing rumblings of a trade for the Blues’ Louie the Bear and a second-round pick, but we don’t think GMGM will pull the trigger. Nine out of ten. Usefulness in a Post-Apocalyptic Setting: Well, he’s a flightless, mute bird with an oversized head–but we would protect him to the death without complaint. Overall Year-End Rating: Nine Good Sashas.